Doris Kearns Goodwin is one of the most gifted and prolific historians of the American presidency writing today. In this thoughtful and timely reflection on the qualities that define good leadership, the Pulitzer Prize winner revisits the lives of Abraham Lincoln, Theodore Roosevelt, Franklin Roosevelt, and Lyndon B. Johnson—four men whose lives she has capably chronicled in her nationally bestselling books. Drawing on her many years of research, Goodwin remarks on the essential character traits and leadership qualities that have served presidents well in “turbulent times,” but without losing sight of the contingencies of discrete historical moments. The book is divided into three parts. 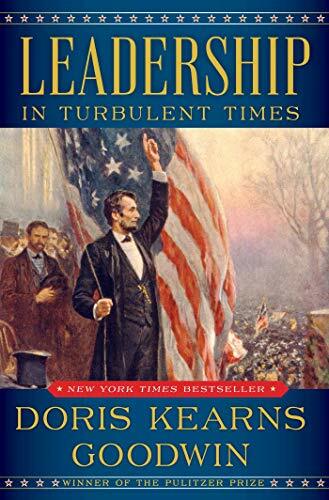 The first examines how each president redirected an inexhaustible ambition (Lincoln’s “ambition,” his longtime law partner William Henry Herndon once quipped, “was a little engine that knew no rest”) into a distinct trademark of leadership, service, and purpose. Ambition helped to launch these presidents’ political careers, but a potent blend of self-searching, compassion, and pluck propelled them forward. So too did personal and political setbacks. The second part of the book explores how each man triumphed over misfortunes on the way to the White House. In the throes of an almost suicidal depression, Lincoln briefly broke off his engagement with Mary Todd; the couple reconciled, even as the future 16th president lent more zeal and energy to his Springfield, Illinois, law practice. Theodore Roosevelt’s wife and mother died on the same day, prodding him to migrate west to the solitude of a cattle ranch on the plains of western North Dakota. Polio paralyzed FDR in his thirties, prompting him to seek out the miracle waters of Warm Springs, Georgia. For his part, LBJ experienced humiliating defeat at the ballot box, losing his bid for one of Texas’s seats in the United States Senate. Redoubling his efforts, “Landslide Lyndon” was elected (though by just 87 votes) to that body seven years later. Next, the author salutes Theodore Roosevelt’s “crisis management” during the Great Coal Strike of 1902, noting that the president not only “grasped the historical moment,” but placed “progressive reform” on the nation’s agenda with his response. FDR’s “gift of communication proved the vital instrument” of his “turnaround” brand of leadership during his first one-hundred days in the White House. Finally, LBJ focused on “the goals he wanted to achieve” and the “verdict of history” during his years in office, some of the most consequential in terms of domestic policy and civil rights. Leadership: In Turbulent Times cannot prescribe answers for the vexing questions of our own, fraught times, but it issues an authentic reminder of the traits and qualities that this nation once looked for in its leaders. Self-abnegation, empathy, adaptability, and a capacity for compromise have become astonishing liabilities in the modern political arena. May the examples of these presidents inspire a new generation of American leaders committed to liberty and justice for all. Brian Matthew Jordan's most recent book is Marching Home: Union Veterans and Their Unending Civil War (Liveright/W. W. Norton), a 2016 finalist for the Pulitzer Prize in History. He is a history professor at Sam Houston State University.